Once upon a time, “Calling Line Identification” and “Last Call Return” were the very height of telephone technology. Cell phones have long since rendered such things obsolete, as they allow one to instantly see who is calling (unless it’s from a “restricted” or blocked number). Of course, plenty of films about the future have people conferring via video phones and holograms. While humanity hasn’t yet made it to the point where such technology is widely available (or affordable), Prometheus has already taken things many steps further. A new viral video entitled “Quiet Eye” allows one to do amazingly thorough and efficient background checks on any and all callers as the call is taking place. How’s that for call screening? In “Quiet Eye”, Peter Weyland receives an incoming video transmission from archeologist Elizabeth Shaw (played by Noomi Rapace), who has a world changing proposition for him. It’s done in split screen fashion. 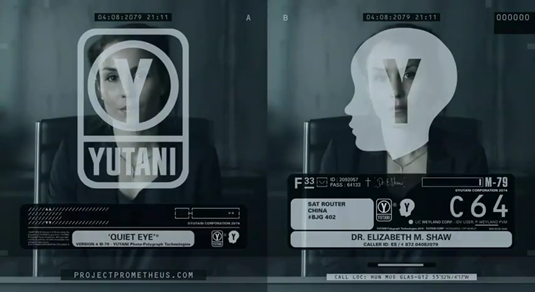 The screen on the left puts Dr. Shaw through a battery of tests, including a polygraph. It even checks her dental records, as well as her name and likeness, against a number of possible matches. The conversation itself isn’t really that interesting. It’s meant to establish Dr. Shaw’s determination, but such character development would be better left for the film itself. Still, it makes me wonder just what Phone calls will be like in the future. The only things missing are blood samples and X-Rays.